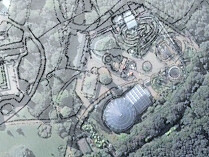 More detailed plans of Alton Towers' proposed new roller coaster for 2010 have been made public. Not only do they show the ride's layout in more detail, but they also show concepts of how the station building may look, as well as artwork for features near the entrance. We've added all of the plans and drawings to our SW6 gallery, in high quality. The plans include profile views of the new coaster, demonstrating the fact that it should provide plenty of airtime for riders, whilst still being around the same total height as Corkscrew. It's believed that the new ride will have a height restriction of 1.2m, making it a mid-level coaster (Nemesis, Oblivion and Air all have height restrictions of 1.4m). The drawings also show the proposed new queue line, which unfortunately looks to be as squashed together as Rita's (known as a "cattle pen layout"). That aside, the new plans certainly look very interesting, with the added intrigue of what happens when the coaster switches direction in part of the station building; the mechanism to do so is not shown on any of the plans.